The Child Fatality Task Force (CFTF) is a legislative study commission that examines the causes of child death and makes recommendations to the Governor and General Assembly on how to reduce child death, prevent abuse and neglect, and support the safety and well-being of children. The CFTF was created in 1991 by state statute as part of the broader statewide Child Fatality Prevention System. 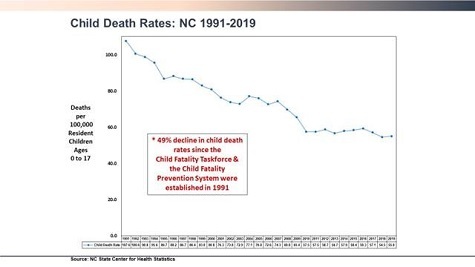 Since 1991, the child death rate has decreased by 47%. CFTF recommendations are formulated through data, research, and expert presentations at committee and full Task Force meetings where the focus is on evidence-informed practice. These recommendations are included in an annual report to the Governor and General Assembly, and also become part of the CFTF’s annual “Action Agenda.” This Action Agenda is the CFTF’s annual blue print of items it seeks to advance or endorse in order to support child safety and well-being. Agenda items may recommend changes to laws or policies, state funding of projects or programs, or other initiatives. During its nearly 3 decades of work, the Task Force has been instrumental in advancing legislation that saves children’s lives and promotes their safety and well-being. A summary of Task Force accomplishments since 1991 is available here on our website. Members and Meetings: There are 35 members of the Task Force -- Four appointed by the Governor; 10 appointed by the Speaker of the House (including 5 legislators); 10 appointed by the President Pro Tempore of the Senate (including 5 legislators); and 11 Ex Officio (by virtue of their position in state government). Appointments address areas of expertise relevant to child fatality prevention. Committees meet 2 – 4 times per year and the full Task Force meets 3 – 4 times per year. Meetings only occur between legislative sessions. Leadership and Committees: The CFTF is co-chaired by two members elected by the CFTF. There are three committees: Perinatal Health, Intentional Death Prevention, and Unintentional Death Prevention. The committees are co-chaired by one member of the CFTF plus one additional volunteer with issue expertise. The Task Force chair, the committee co-chairs, and a full-time Executive Director of the Task Force make up the Executive Committee of the Task Force. Child Fatality Prevention System: The Child Fatality Task Force is part of a three-pronged Child Fatality Prevention System set up to identify and address system deficiencies. This system includes multidisciplinary local and state teams who review individual cases. Local Prevention Teams consist of Community Child Protection Teams who review abuse and neglect cases and related deaths, and Child Fatality Prevention Teams who review other deaths; in some counties these teams are blended. The State Child Fatality Prevention Team (State Team), with leadership from the Office of the Chief Medical Examiner, reviews cases involving unexpected/unexplained causes of death. The Child Fatality Task Force is the policy arm of the system (and does not review individual cases). For more information on the State Team, please visit http://www.ocme.dhhs.nc.gov/nccfpp/index.shtml. Two-thirds of all child deaths are to infants (under age 1). The Perinatal Health Committee (PHC) focuses on the reduction of infant mortality with emphasis on promoting equity in birth outcomes and reducing prematurity, birth defects, SIDS, and other perinatal conditions. Some accomplishments include being recognized as a national leader in the use of 17-progesterone to reduce subsequent preterm births, promotion of best practices for safe sleep, and breastfeeding, as well as creation of the NC Equity in Birth Outcomes Council. The Unintentional Death Committee (UDC) focuses on preventing unintentional child deaths such as those due to motor vehicle accidents, poisoning, drowning, or fire. Some accomplishments include graduated drivers license requirements, increased penalties for speeding in a school zone, improvements in the Controlled Substances Reporting System, booster and infant seat requirements, ATV restrictions, increased fee to restore a suspended license to help fund the detection, deterrence, and conviction of impaired driving, bike helmet laws, and smoke detector and CO requirements. The Intentional Death Prevention Committee (IDC) focuses on preventing abuse and neglect, suicide, and homicide. Some accomplishments in this area include re-writing child welfare laws, supporting home visiting and family preservation programs, promoting Safe Surrender for babies who would otherwise be abandoned, increasing the penalty for selling a gun to a minor and manufacturing methamphetamines in a location that endangers children, and support for trauma-informed care.